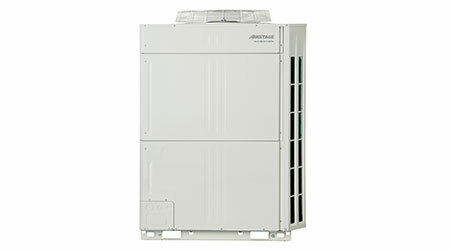 Airstage V-II VRF line of Variable Refrigerant Flow (VRF) heat pumps includes 6, 8, and 10 ton condensers, helping to reduce the number of condensers in certain configurations. V-II 230V/3-phase, zoned VRF systems offer large capacity and operational efficiencies up to 24.30 IEER (to AHRI 1230 standard). Airstage systems include a lineup from 6 to 24 tons with a connectable indoor unit capacity ratio up to 150 percent, while also allowing up to 45 indoor units per bank of three condensing units. High efficiency is achieved by using a single DC inverter-controlled, twin rotary compressor per condenser. The system also has a total pipe length of nearly 3,300 feet. Heating operating range spans ambient temperatures from 70F to as low as -4F, while some single systems provide cooling when ambient temperatures fall to as low as 5F. Indoor units come in a variety of styles: wall mount, cassette, compact duct, floor/ceiling mounted, and high static pressure duct. Up to three condensing units may be linked with twining kits. 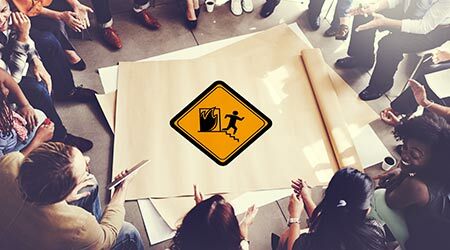 Applications include churches, medical facilities, office buildings, and schools. New equipment is compatible with all current indoor units (including RLAV models), remotes (2 and 3-wire models), central controllers and BMS gateways. Web monitoring capability, easy service and maintenance, and peak cut operation make the systems ideally suited for new commercial construction and retrofit installations.